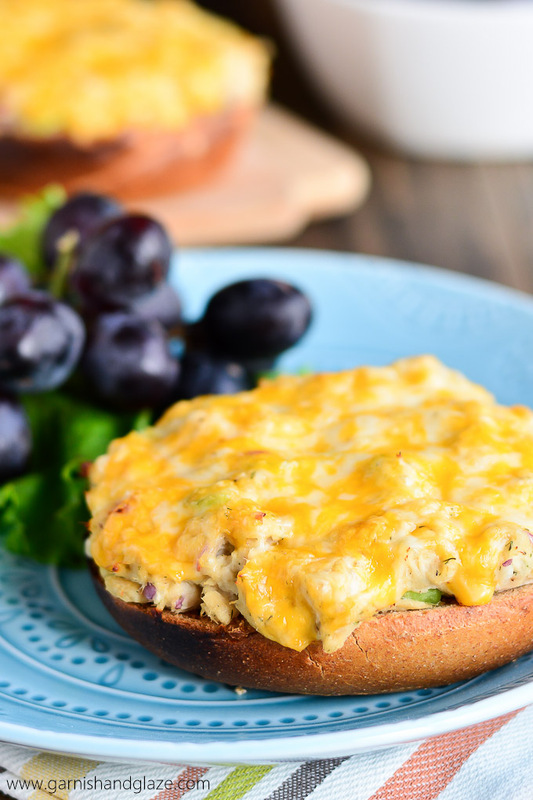 Make Bagel Tuna Melts for a warm, toasty, and cheesy lunch! 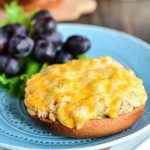 Tuna melts were one of my favorite lunches to eat on weekends when growing up. My mom would often make them on Sundays for a yummy and easy meal to enjoy after church. 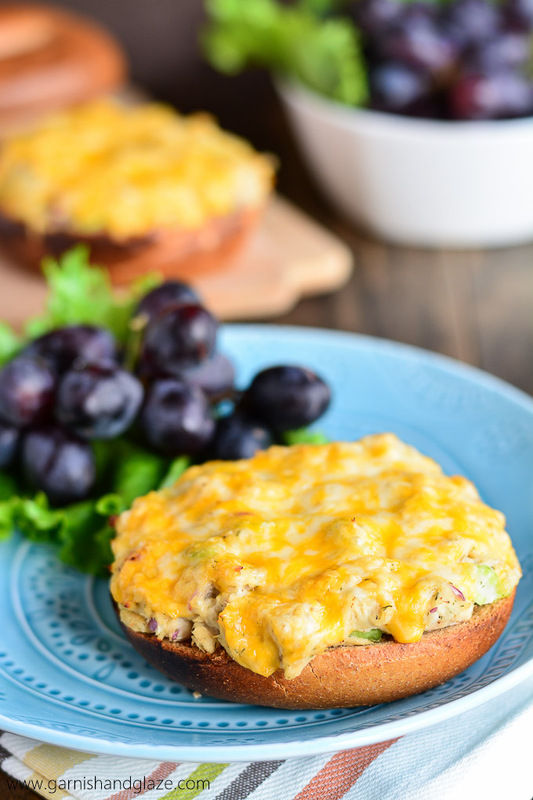 These melts have a whole wheat bagel as the base with tuna salad on top. And what a tasty tuna salad it is! It’s made with White Albacore Tuna (not that cat food like chunk light kind), fresh crisp onion and celery, and a few spices and herbs. It’s then topped with lots of cheese that melts down into the tuna. So good! If you have little kids that won’t eat this large of a portion you can use English muffins instead of bagels. And if you want to cut down on carbs you can get bagel thins. Serve this melt with a side of fruit and/or veggies and you’ve got a delicious balanced meal! Place bagels cut side up on a foil lined baking sheet and broil for 1-2 minutes until lightly toasted. In a mixing bowl, mix tuna, onion, celery, mayonnaise, lemon pepper, and dill weed until evenly combined. 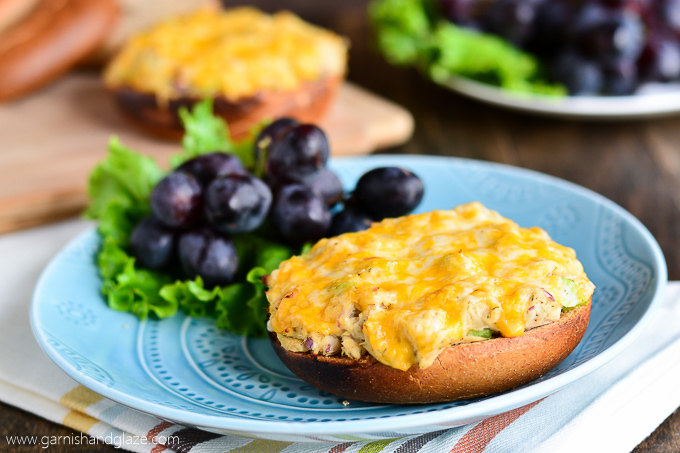 Top toasted bagels with tuna mixture and sprinkle with cheese. Broil for 3-4 minutes until cheese is melted. Serve while hot. Haha! So true. Can’t go wrong with more carbs! This looks amazing! I definitely want to try this for dinner one night next week! You’ll love it Paige! So quick, easy, and most importantly delish! I love tuna melts and I too grew up eating them and still do. Only I love how you used a bagel, I use hamburger buns. Bagel tuna melts sound waaaaay better!! I LOVE tuna melts! They’re surprisingly versatile and work well with a variety of mix-ins–dill pickle, sun-dried tomatoes, balsamic vinegar, and tarragon are some of my favorites (and yes, all together!). I’ve never used colby jack as the cheese, though. Can’t wait to try it!